Here's the schedule of upcoming classes in the San Diego area. If you'd like to register for a class, please email me at papermadebakery@gmail.com. I update my class schedule frequently, so check back often! 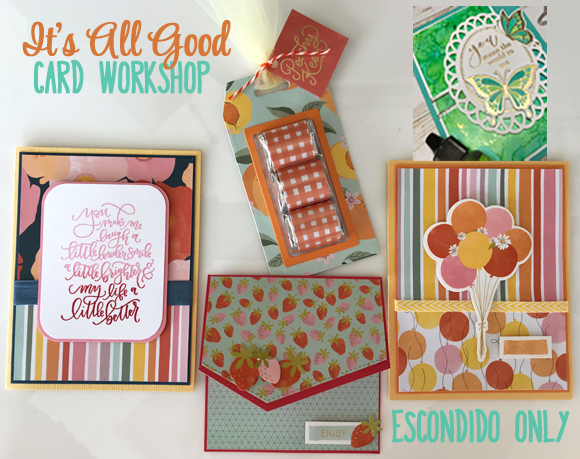 April's card workshop -- It's All Good This month's cards (and treat tag) feature the newest paper line from Dear Lizzy called "It's All Good", filled with beautiful peaches, yellows and muted aquas, plus coordinating spring icons sure to make you smile. 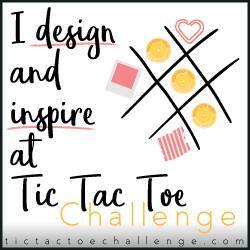 We're trying out several cool techniques and learning about design and layout, too. Everyone gets a full 6x8 patterned paper pad and coordinating 6x12 sticker packet. Don't miss this one -- beginners and up -- everyone's welcome! Kits ARE available this month! Simply select the KIT - Shipped option from the PayPal drop-down below and we'll ship your kit (USPS Priority Mail to addresses in the contiguous US). Please bring to class your basic tool kit including a variety of adhesives, scissors, and corner rounder. Space is limited, so register and confirm early! This is a great class for all levels - beginner to ol' pro! Invite a friend to join the fun. This month's class is held only on Saturday, April 20 in Escondido. We'll send more details when you register. Prepayment is required to reserve your space in this class. Contact me via email for info on payment by cash or personal check.